The Loft Stage » Stars on Broadway Features Lofties! Stars on Broadway Features Lofties! WCT’s Stars on Broadway will feature many names familiar to The Loft Stage. Lofties Abby Feuer, Faith Goetzke, Ethan Williams, Tony May, Brendan Finn and Joey Engh are all featured in the production. Isabella Wurm is playing the piano and technician Colleen Jensen is running lights. Don’t miss what promises to be a wonderful evening of Disney moments. 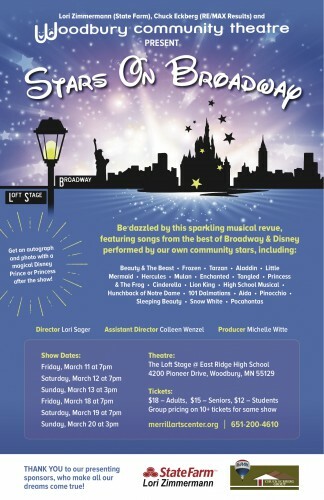 For tickets call 651-200-4610.